Image | This entry was posted in Humor, Photography and tagged birds, finches, house finches, humor, photography. Bookmark the permalink. 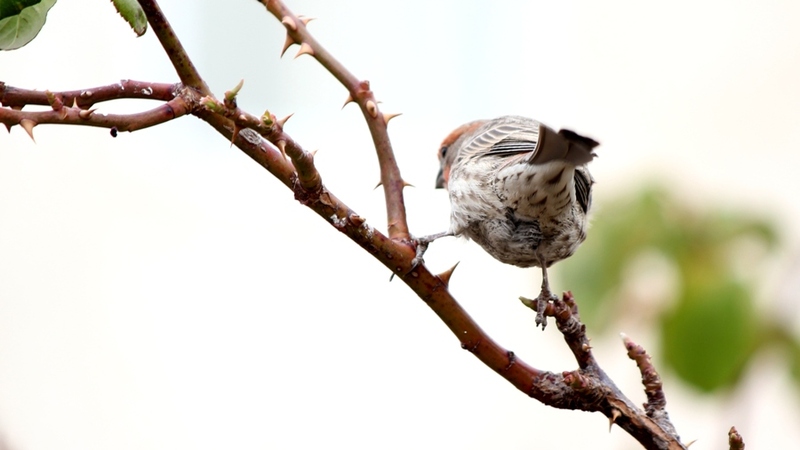 Oh those thorns look quite treacherous for the soft little birdie! He lets me get really close these last few days, which is not typical of the finches. I think he may be hurt. He can fly but doesn’t very far–just stays on the fence and on the feeder. He may have gotten injured by a hawk attack; then again, he might just enjoy scarfing down my food! Oh poor little darling–there’s something so precious about little birds–like the sparrows we are. Soothing is good. It certainly is soothing to the soul in the taking. Wow, great form. I give him a 9.5! Great shot Lilly! Thank you! Not getting much sleep. Thank you for praying. I have a lot on my plate right now. Hope you guys are staying warm. Yikes, what a cold snap! Every time I see things, I think “If he made just one wrong move…” That’s too bad he is acting sick. Does he have that eye disease? He just doesn’t fly away, which is unnatural. He seems to be eating well, and he flew a little along the fence and on this bush. Typically, I would not get 2 feet away from him to click a pic as I did here. So I think he must be injured. He was like that, just perched by himself on the fence, for at least a couple of days. But he is gone now, so . . . things+this!! Probably a boy was talking to me at the time.